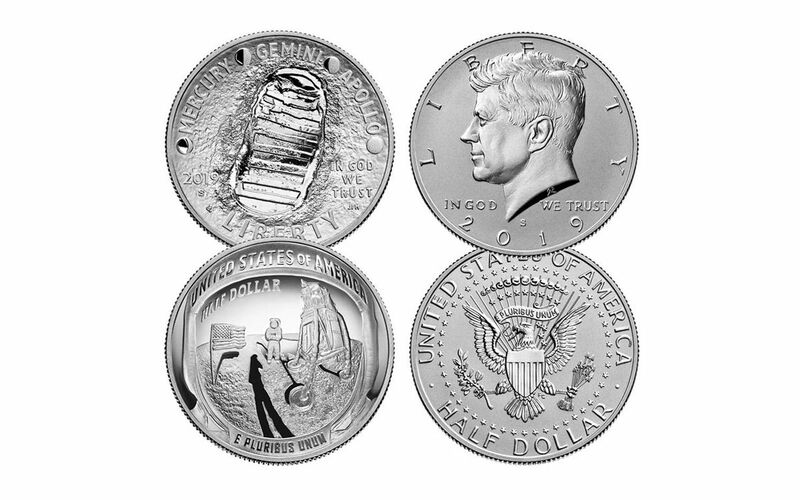 U.S. Mint Set Commemorates Anniversary of One Small Step for Man…. On July 20, 1969, the people of Earth were glued to their television sets. Before their very eyes, a door opened, a ladder descended, and a man first set foot on the surface of the Moon. The footprints, the flag and plaque left on the lunar surface sent an eternal message throughout the cosmos: humanity had finally reached the heavens, and America led the way. In honor of the 50th anniversary of the Apollo 11 mission, Congress authorized the release of this special, limited-edition commemorative silver dollar. Not just any half dollar, it’s the U.S. Mint’s first five-ounce coin with a proof finish, reeded edge and curved surface! On the coin’s obverse is the indented footprint left by astronaut Neil Armstrong along with the names of the space programs that led to such a historic moment: MERCURY, GEMINI and APOLLO separated by phases of the Moon. Flip the coin over and you’ll see the outward curve of an astronaut’s helmet. The design recreates a close-up of the famous photograph snapped by Neil Armstrong of Buzz Aldrin. Now you can get this coin along with a specially-struck Kennedy Half Dollar that is available only in this commemorative two-piece set. As you probably know, President John F. Kennedy called for the United States to land a man on the Moon by the end of the 1960s. Sadly, Kennedy never saw his call to action fulfilled. An assassin’s bullet may have cut him down, but America prevailed and completed the task JFK had set out before her. The Kennedy Half Dollar in this set is a 2019-dated coin struck at the San Francisco Mint with an Enhanced Reverse Proof finish. This special Kennedy Half Dollar is limited to just 100,000 coins and will not be made available by the Mint individually or as any other packaging option. Not only were both of these coins beautifully struck at the San Francisco Mint, each coin will come sonically sealed in an acrylic holder that commemorates the 50th anniversary of the first lunar landing in 1969 with a special Moon display core that resembles the Moon’s surface. Your exclusive two-piece set will also arrive in its official government packaging. 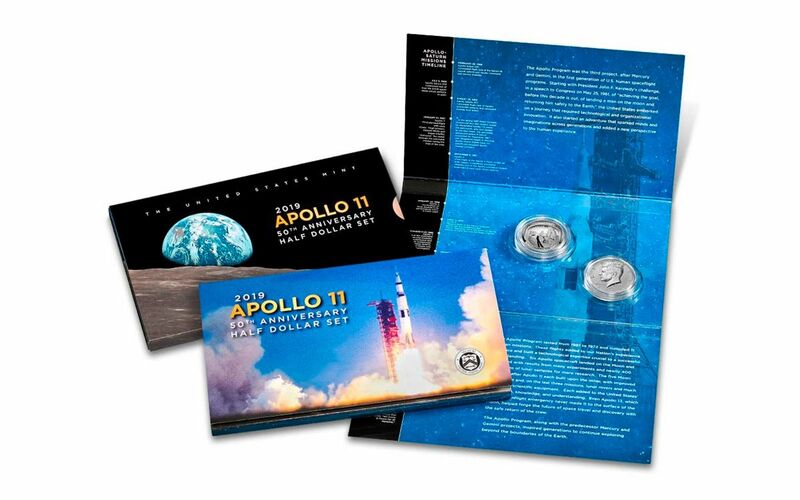 With just 100,000 of these historic 2019-S Apollo 11 50th Anniversary 50¢ Two-Piece Proof Sets available, a quick sell-out is expected. As a one-year-only issue, these curved coins will never be struck by the U.S. Mint again. When they’re gone, they’re gone! Don’t miss this historic release – it’s one small purchase for you and one giant leap for your collection! ONE-YEAR-ONLY 50TH ANNIVERSARY OF APOLLO 11 COMMEMORATIVE – The 2019 Apollo 11 50th Anniversary Clad Half Dollar Coin features Neil Armstrong’s footprint on the obverse and the image of Armstrong’s famous photo of Buzz in which Aldrin’s visor reflects an image of Armstrong standing beside the landing module. The unique design that mimics the visor of an astronaut’s helmet represents just the second time in history that the U.S. Mint has struck a coin with a curved surface. EXCLUSIVE AVAILABILITY – Joining the one-year-only commemorative half-dollar is a special Kennedy Half Dollar featuring an Enhanced Reverse Proof finish. A reverse proof differs from regular proof coins in that it features frosted fields and mirror-like details in contrast to a regular proof’s mirrored fields and frosted details. The U.S. Mint is making this coin available only in this two-piece set and will not be made available by the Mint individually or as any other packaging option. LEGAL-TENDER COINS – These coins are fifty cents legal tender in the United States. STRUCK WITH GORGEOUS PROOF FINISHES – Your coins will come in gorgeous Proof and Reverse Proof condition, meaning each was expertly crafted by the mint from hand-selected planchets, polished dies and multiple strikes to produce beautiful details! EXCLUSIVE DISPLAY CORE – Each coin will come sonically sealed in an acrylic holder that commemorates the 50th anniversary of the first lunar landing in 1969 with a special Moon display core that resembles the Moon’s surface. LOW LIMITED EDITION – the U.S. Mint is limiting this release to just 100,000 two-piece sets. Put the first man on the moon into your collection and honor mankind’s crowning achievement with the 2019-S Apollo 11 50th Anniversary 50¢ Two-Piece Proof Set. Order yours now!